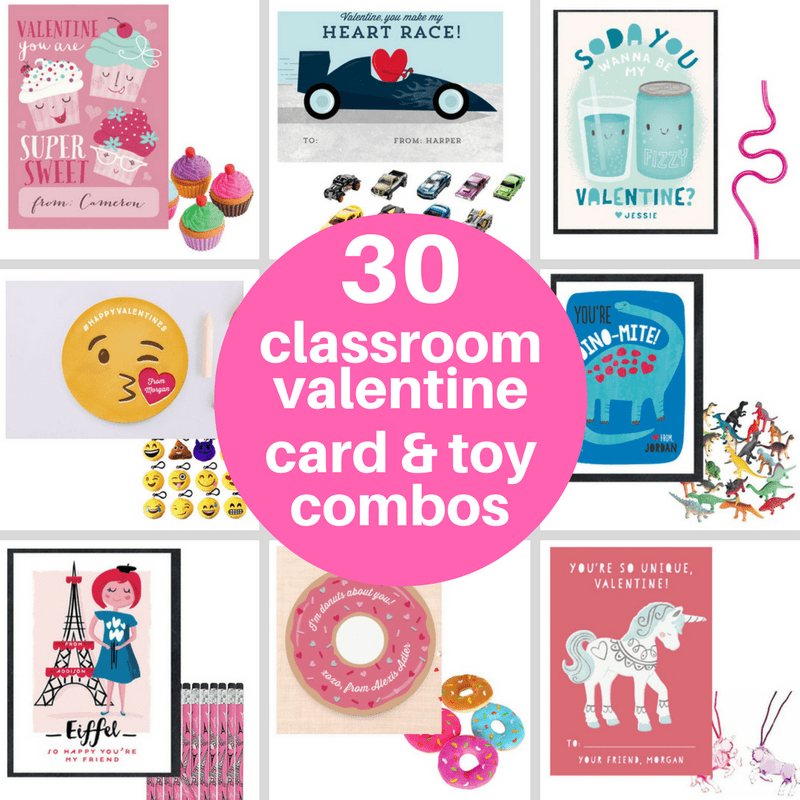 A roundup of the the 30 best Valentine's Day classroom cards and toys. 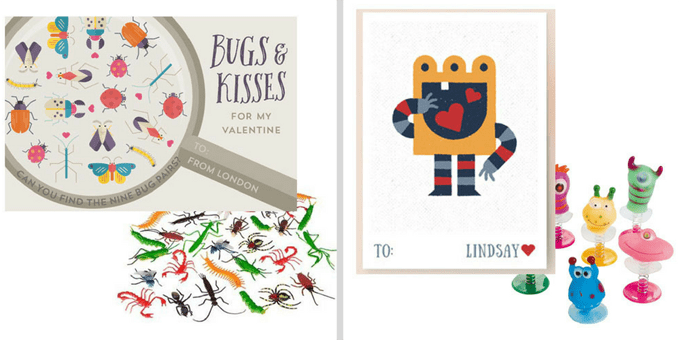 A roundup of the the 30 best Valentine’s Day classroom cards and toys. 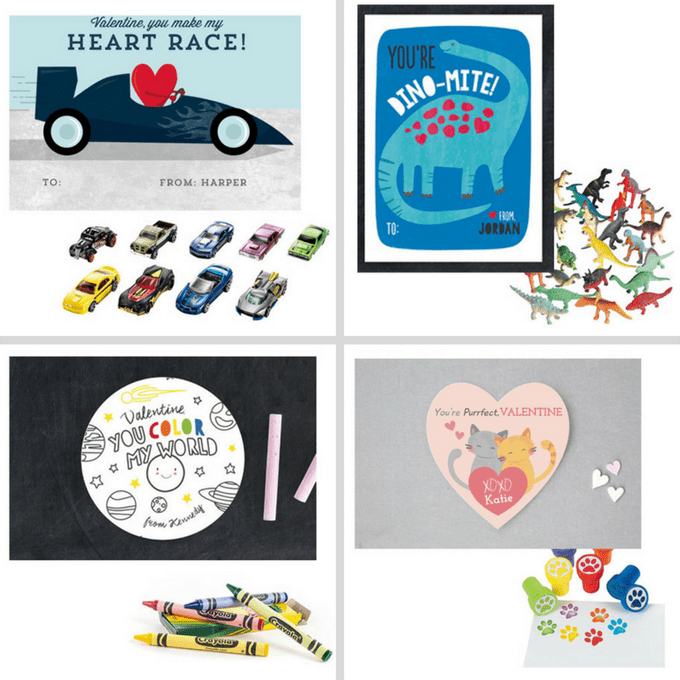 Minted compensated me for my daughter’s Valentine’s Day cards this year, but all opinions below are my own! Post also contains affiliate links. 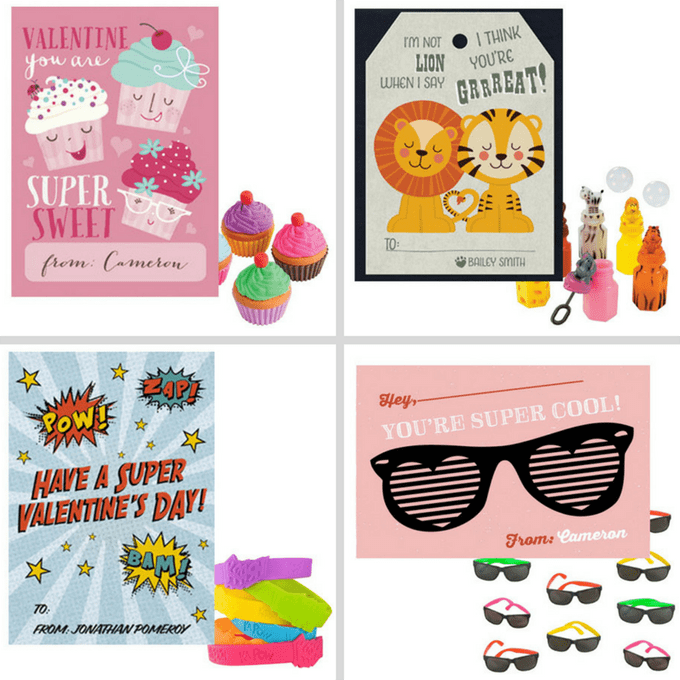 Sweet, personalized cards paired with inexpensive, little toys simplifies your kids’ Valentine’s Day classroom cards. 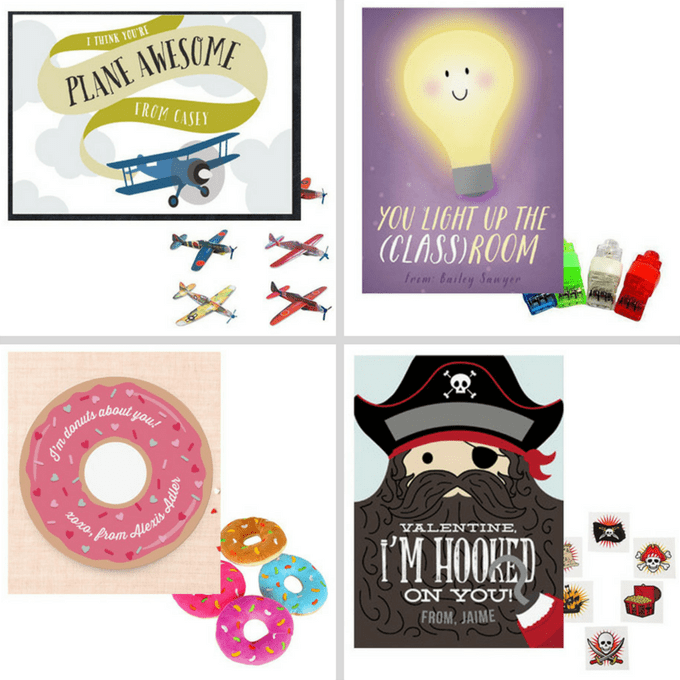 Below are 30 awesome (and candy-free) ideas! As many of my fellow parents know, Valentine’s Day classroom card giving can get pretty competitive. When we were kids we picked out a box of cards from the drug store, filled in the names, made our brown lunch bag card holders and called it a day. Now, thanks to the likes of Pinterest and its millions of perfectly presented DIY ideas, the Valentine’s Day season is a little more complicated. 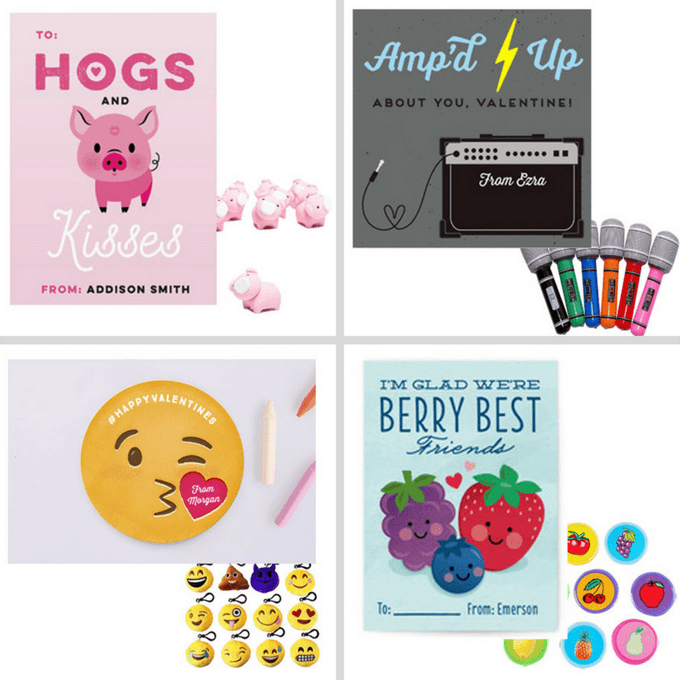 I’m one of those guilty of making things more complicated with my own Pinterest board full of Valentine’s Day card ideas. But I don’t want things to be complicated. Truly. I want all things cute, simple, easy. Enter Minted. I believe we can all reach a middle ground, some place between pulling from the bottom of the drug store pile and giving kids elaborately constructed chocolate and strawberry robots with five dollar bills attached. And it’s this: A cute card (chosen by your kids) with a matching, inexpensive toy. That’s it. You have the classic card to give with just a tiny bit of extra fun. Nothing over the top, but absolutely remembered. 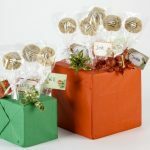 If you like, package the two together in cellophane bags with ribbon. Or, you can punch a hole in the card and attach the toy with ribbon. 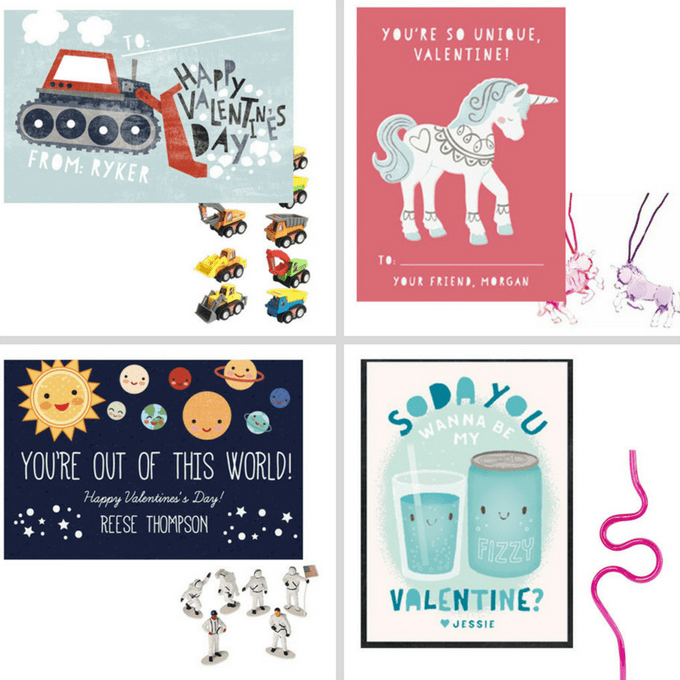 Here are my favorites from Minted’s collection of Valentine’s Day cards and some ideas for toys to accompany them. Pig cards with pig erasers. Rock star cards with rock star microphones. Emoji cards with emoji key chains. Berry cards with fruit stamps. Sushi cards with sushi erasers. 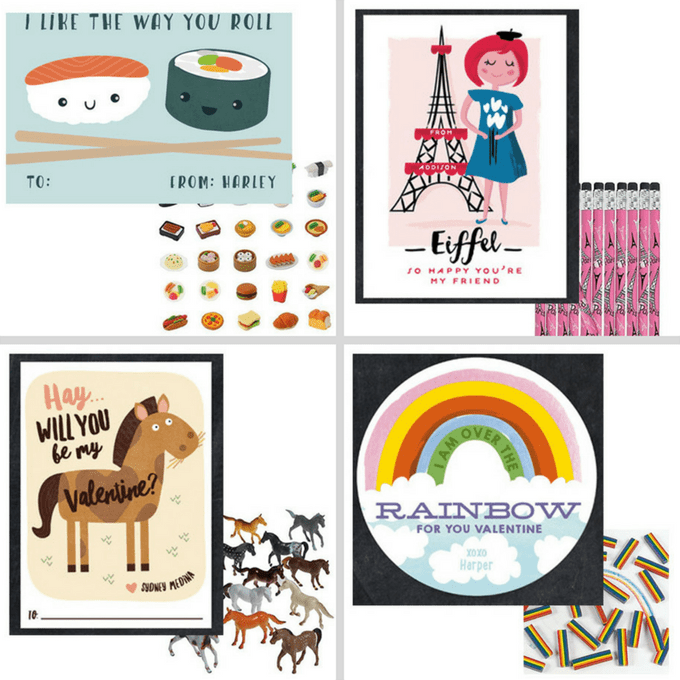 Paris cards with “I love Paris” pencils. Horse cards with toy horses. Rainbow cards with rainbow crayons. Sweets cards with cupcake erasers. 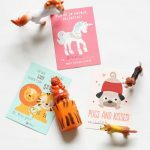 Lion and tiger cards with zoo bubbles. Superhero cards with superhero bracelets. Truck cards with toy trucks. Unicorn cards with unicorn necklaces. Outer Space cards with toy astronauts. Soda cards with crazy straws. Shark cards with mini shark squirts. Ruler cards with alphabet rulers. Gem cards with light up rings. 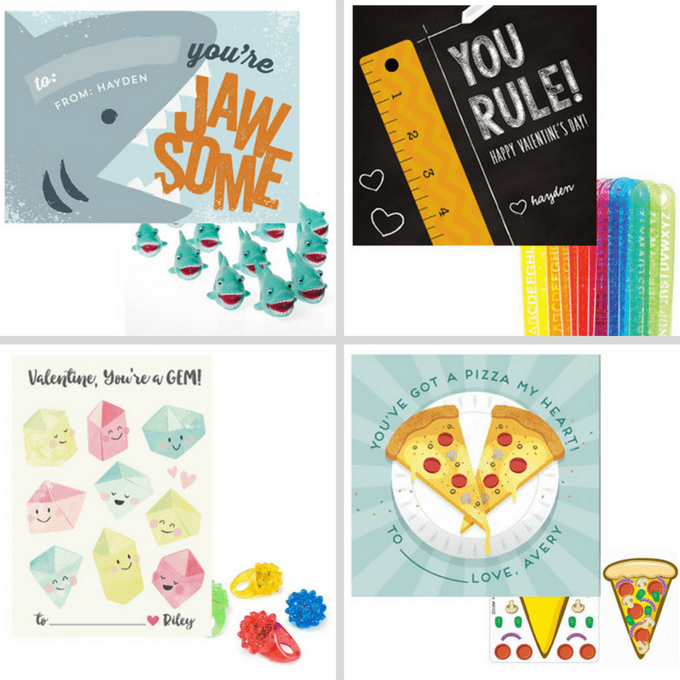 Pizza cards with make-your-own pizza stickers. Plane cards with toy planes. Light cards with mini flashlights. Donut cards with plush donut toys. Pirate cards with pirate tattoos. Racing car cards with Hot Wheels cars. Dinosaur cards with toy dinosaurs. Kitty cat cards with cat stamps. Bugs cards with these creepy bugs. Monster cards with monster pop-up toys. 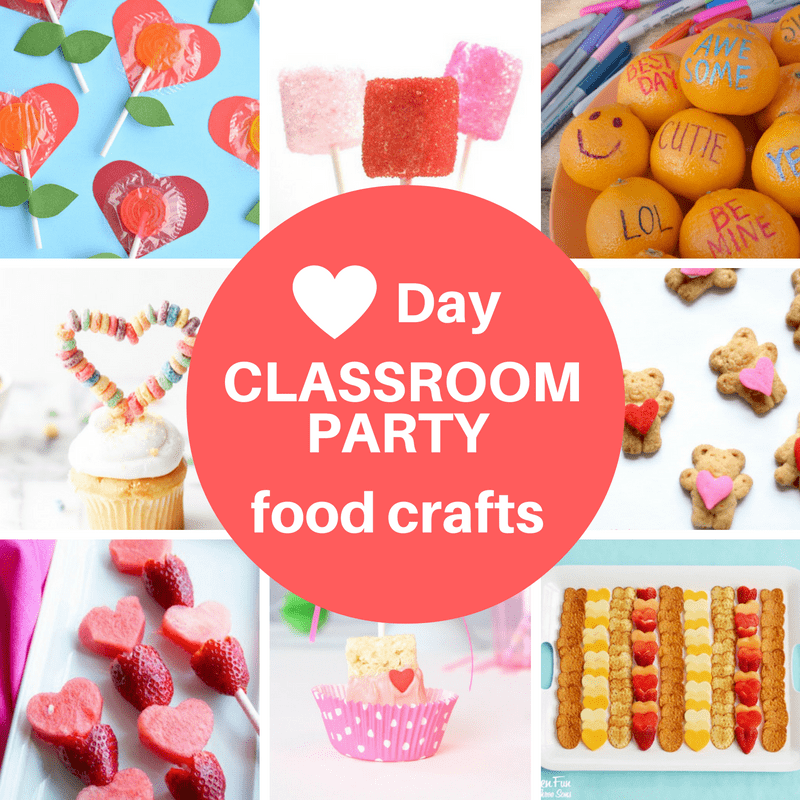 If you like these ideas, be sure to check out my Valentine’s Day classroom food crafts roundup. Thank you! Prints+amazon prime is my jammm. These are all great ideas, I’ll let my 7 year old first grader choose one. Thank you for doing the work of finding coordinating toys! Thanks so much Victoria! My 4yo chose the zoo one and my 9yo the unicorn ones. Two kids, same life, totally different!